With the 10th edition of the European Satellite Navigation Competition (ESNC) set to begin on April 1, 2013, competition organizers are inviting submission of innovative GNSS application ideas. The competition will be officially kicked off on April 25 at the European Navigation Conference (ENC) in Vienna, Austria, at the Austria Center Vienna (Plenary Session) from 1:30 to 3:00 p.m. Admission will be free of charge. 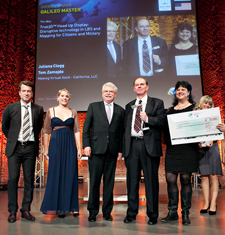 In the 2012 ESNC competition, more than 400 ideas were submitted from around the world competing for a number of regional, special topic, and prototyping prizes as well as the top award, the Galileo Master. Last year, Fraunhofer Portugal and the University of Porto’s Faculty of Engineering received the €20,000 Galileo Master’s prize for a new smartphone app that augments GNSS with ultra-low magnetic field communication (ULF-MC) for reliable navigation in office buildings, airports, underground parking garages and other indoor locations. The European Navigation Conference 2013 will be the 17th conference in the GNSS series held under the auspices of the European Group of Institutes of Navigation (EUGIN). The conference will be hosted by the Austrian Institute of Navigation (OVN) and will take place from 23-25 April 2013 in Vienna, Austria. For further information, please refer to www.enc2013.org.